Depression is a sign that the body is not in balance. Life altering events such as the loss of a loved one, can cause the body to be in a constant state of stress. If stress is not managed, depression can manifest itself in many forms. To be diagnosed with depression, the symptoms should be present for a period of at least two weeks. Situational grief should not be confused with depression as grief has a cause, whereas depression can exist with or without any known stressors. A low mood throughout most of the day that is present from day to day with little change. Clear, diminished interest in many activities that you once enjoyed or the feeling that “nothing is fun anymore”. Significant weight gain or weight loss. Depressed people tend towards extremes and may either not eat due to a lack of interest or overeat as a way to find comfort. Difficult sleeping, especially falling and staying asleep, or in the reverse, sleeping all of the time. A marked decrease in energy levels. Depressed people may yawn excessively and appear as though they are never fully awake. Feelings of worthlessness or guilt that have no apparent root and are ongoing. Indecisiveness, with a marked inability to concentrate. Lower levels of depression can include any number of the above symptoms but with less severity. Before depression gets out of control, acupuncture can help to restore the body to its natural balance. Acupuncture can potentially ward off the need for prescription medications to treat depression. Acupuncture is a safe, affordable way to give your body a chance to heal itself. Depression is difficult and if you are suffering from depression it is likely you want relief yesterday, not in a month or two. Acupuncture is not going to take away the causes of depression, but acupuncture is likely to help you deal with life situations more effectively. One type of prescription medication for depression includes SSRI’s, or selective serotonin reuptake inhibitors. SSRI medications include Prozac, Paxil, and Zoloft and they work by allowing more serotonin to remain in the brain for longer periods of time. Serotonin is a chemical in the brain linked to a sense of well being and people suffering from depression have lower levels than normal. SSRI’s are effective with treating depression, but therapeutic effects of the medication may take weeks to be felt. Acupuncture can have an immediate impact on a depressed mood, sometimes even during the course of the first treatment. No, you are not likely to feel completely healed immediately, but acupuncture treatments can impact the body right away. The side effects of SSRI’s can include a significant decrease in libido, weight gain, headaches and sometimes they can increase levels of depression in a small number of people. Patients beginning a course of SSRI treatment need to be mindful that their potential for suicidal ideation can increase from the medication. There are no known negative side effects to using acupuncture as a way to alleviate depression. Possibly Better Than, or Similar To Prozac, But With Less Side Effects. A recent study was published in January 2008 by doctors out of Guangzaou, China who were studying the effects of acupuncture in treating depression. Doctors concluded that acupuncture is an effective and safe therapy for depression; the therapeutic effect of acupuncture on depression is possibly better than or similar to that of Prozac, but with less side effects. Other prescription medications for depression include tricyclic antidepressants (Elavil, Vivactil) and MAOI inhibitors (Nardil, Marplan). Tricyclic antidepressants have a number of side effects and can interact with sleeping medications, contraceptives, tobacco, and alcohol among other things. People that are prescribed MAOI inhibitors must avoid certain foods such as aged cheeses and wine or significant, potentially dangerous side effects can occur. Depression is a complex disease that literally has ups and downs. A Overland Park acupuncturist can be just the person to help you feel more relaxed, more balanced and able to deal with the world around you. Acupuncture alone may not be the only treatment you seek, but acupuncture can be either used alone or as a complimentary treatment for depression. Before you decide to use prescription medications to deal with your depression, consider all of your options. Acupuncture is painless and helps your body restore itself to a state of balance. Prescription medications have their place, but they are not a cure. Prescription medications manage symptoms but do not provide the overall health benefits that acupuncture can. I want to thank you for reading my Acupuncture Overland Parkdepression information. 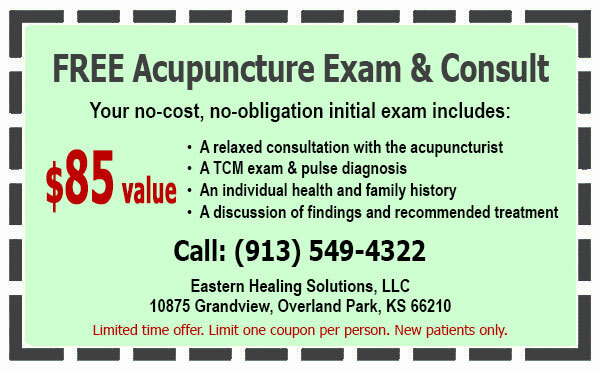 In return I would like to offer you a coupon for a FREE Initial Acupuncture Exam ($85 value.) This coupon is good for one initial exam and limited to one coupon per person. If you, or a loved one is in need of my services, please print out the coupon and bring it on your first visit. SAVE $85 - Click on the coupon to download it now. If you have any questions send me an e-mail or call me at (913) 549-4322. I’ll be happy to answer your questions and discuss your concerns. "A year and a half ago, I developed shingles in my right arm and hand. The searing, debilitating pain and weakness continued despite conventional treatment. My Chiropractor suggested that I see Cindy. "My experience with Cindy's expertise has been life changing for me. When I began treatment at Eastern Healing Solutions, my health had been declining for several years without improvement from..."
"My visit to Cindy was to tackle GI disturbances and pain. In my mind, decrease the pain to a manageable level. Pain is a deceptive symptom. You don't realize how it infringes on every aspect of your life..."
Serving Overland Park, KS and Kansas City, MO. 66211, 66213, 66215, 66219, 66220, 66221.